A tree is called ਰੁੱਖ in Punjabi. ਬੋਹੜ i.e. 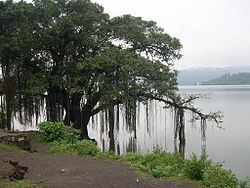 banyan is the National tree of India. It is a leading component of the triveni, consisting of the banyan tree, the sacred fig tree and the neem tree. From times immemorial it has been central to the Indian village life. 2. Write the names of five fruit bearing trees. In this chapter, you were introduced to trees. The next chapter shall be devoted to vegetables.